I’m a first-time Romwe customer and I have to say, I’m pleasantly surprised with the items I bought from the site. Bottom line from me, considering the price and quality of the clothes and shipping time, I’ll be purchasing from Romwe again. I wanted to get some clothes for my first cruise with my husband and wanted some tropical clothing. The trouble was stores, even in Guam, were selling winter clothes. So I placed an order on Romwe’s website on Nov. 26, 2018. Our cruise would sail in January and I was hoping the items would ship in time. Good news: it did! All the items, as I ordered them, arrived on Dec. 18. This might seem like a long time but considering the Black Friday/Cyber Monday rush and considering that a Fashion Nova order I placed a week after I ordered with Romwe hadn’t even been shipped yet, I considered the delivery time a win. Surprisingly, everything I ordered turned out to be pretty much how I expected. Note: I expected the clothing quality to be about Forever 21 quality because the pricing. I paid less than $80 for the who shebang. So I set the quality bar at the Forever 21 level and I pretty much got exactly that but without the F21 markup. HALLELUJAH! The color is so amazing! I love this top, I just have to style it with a camisole or something inside. It fits pretty cropped. Looking every bit of the $1.70 I spent. BUT STILL CUTE! I should’ve taken more photos of this pretty blouse but I failed you, dear reader. “Hey there, Delilah?” It’s a nice quality shirt considering it’s like $7. Very soft, jersey-like material. More of an off-white than a bright white though, which I actually like. I bought this in November for the cruise but I didn’t end up wearing it and I can’t find it on the Romwe website any more. Well, it wrinkles pretty easily but I think that’s forgiveable. It could be like a lewk. The Wrinkled Lewk. I am a size 11 in Fashion Nova jeans and toggle between a size 9 to 11 jeans, so I ordered a Large in the tropical print pants. I’m also 4’ 11” and the pants fit my thighs, waist and I didn’t need to hem it. Note: if you’re taller than me, I think these pants would fit more like a culottes probably. The t-shirts, which I was expecting to be some Hanes type situation, turned out to be a nice jersey stretchy material. They’re also both quite soft. As for the other items, the colors were pretty much true to their photos the website and the sizing was, again, as expected. 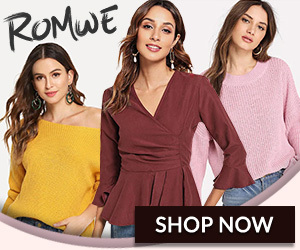 My Romwe experience: pleasantly surprised and fit my expectations. I think I want to order shoes from them next. I also am challenging myself not to spend more than $35 on clothing or shoes a month this year. We’ll see how that goes. March 2019 edit: This post now contains affiliate links dear friends, which means if you click through I might earn a commission on purchases at no extra cost to you.